Rosee has a best friend. No, it’s not Simon. He’s more her partner in crime, her devoted little follower, her antagonist at times even. 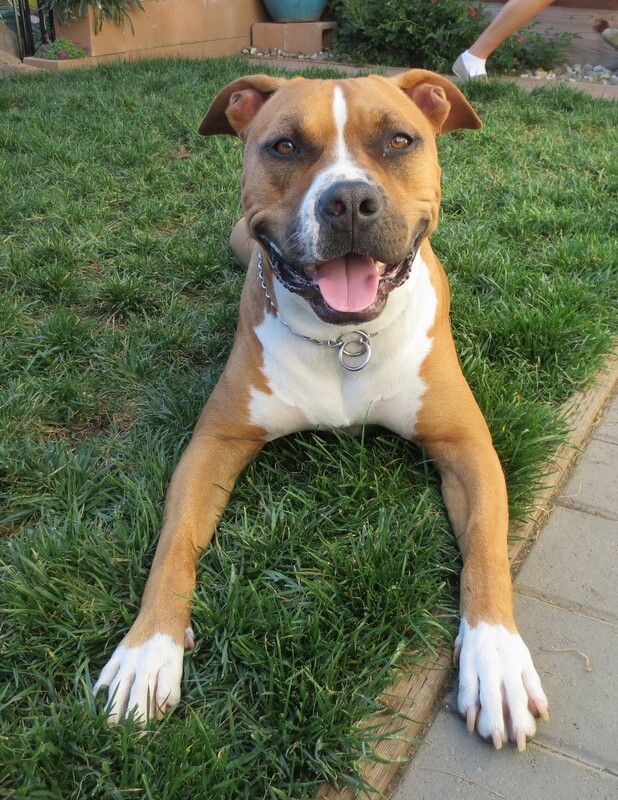 Rosee’s best friend, on the other hand, is our neighbor’s dog, a Pit Bull that shall henceforth be known as Sunny. Now, Sunny is sort of an enigma of a dog. She’s been around for about the past eight years, adopted when she was just a puppy. She’s also had the run of the backyard for that same number of years, being the only dog in the neighborhood of backyards that includes four landlocked together. However, it was just over three years ago that Simon launched an invasion on the backyards when he became a part of my family. 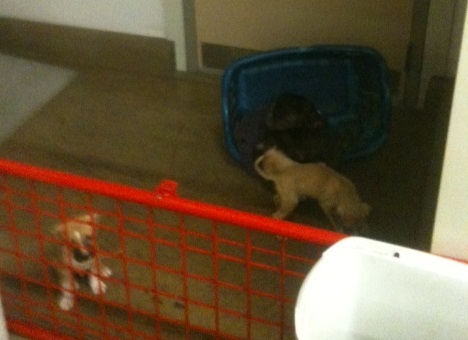 Simon’s entrance was soon followed by other neighboring dogs, a Pit Bull and an older Great Dane . It was around this same time that Rosee became a permanent fixture in my backyard as well, firmly taking control of guarding her fence (for better or worse). All of a sudden, Sunny was bombarded on all sides with dogs, dogs, and more dogs. No longer was she alone to wallow in her backyard, but she was surrounded with new best friends. It became clear when Simon was a puppy that poor Sunny did not get much socialization with other dogs. 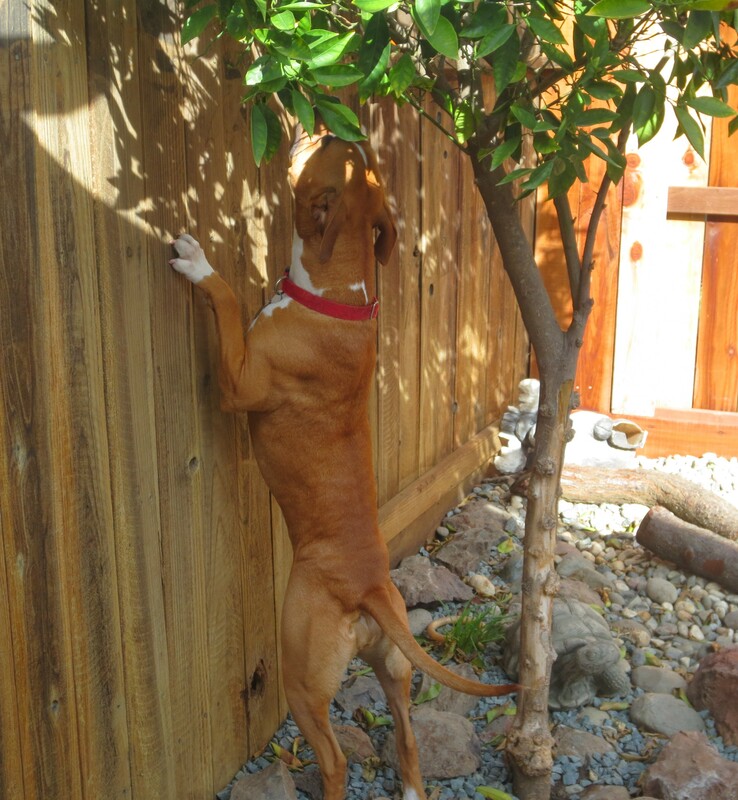 When she found Simon outside Sunny would immediately rush the fence and start huffing and running. While never outwardly mean, her behavior was slightly aggressive, though to be fair Simon thought it was all in good fun and would run back and forth along the fence practically smiling as he did it. Overall, Sunny’s reaction to Simon was never that worrisome because Simon didn’t know any better and Sunny’s owners always made sure to call her back to them when she became too much. However, it became clear as more dogs joined the “Backyard Crew” that Sunny’s reaction to other dogs had the potential to be quite dangerous. It turns out that most dogs do not react to slightly aggressive dogs like Simon does. In fact other dogs, including Rosee, and the two other neighbor dogs, get rather upset when another dog acts the way Sunny does, thereby reciprocating with similar gestures. It all starts with some huffing and running to catch glimpses of each other through the fence. Then a staring contest to see who will break first. An ear-piercing war cry is launched (seriously I never knew Pit Bulls could be so high-pitched until getting one of my own and getting to know the neighbors’) and finally comes the jumping at the fence and barking. The fence shakes and the whole episode sounds vicious. The first time it happened I actually thought that Rosee and Sunny had gotten a hold of each other, but fortunately the decade-old fence held up. Simply put, Sunny was not a fan of the new dogs encroaching on her territory. Also clear, as much as Sunny liked to tussle with all four neighbor dogs, Rosee was her favorite. In the beginning Sunny and Rosee would fight at the fence up to three times a day. It was summer and both dogs would go inside and outside as they pleased, which meant more often than not they ended up outside in their respective backyards at the same time, spelling loud, loud trouble for the rest of us. Rosee and Sunny were perfectly matched. The same size, same height, same build, both females, and both terribly territorial. It was this sameness though, this commonality that ended up sparking the fights at the fence between Rosee and Sunny because, come to find out, they were (and still are in some ways) both anxious and nervous dogs that had no real socialization with other dogs during that crucial time growing up. That’s it. They weren’t inherently aggressive dogs. They weren’t stereotypical Pit Bulls. They were just un-socialized. Such a simple concept really, socialization. The process of learning how to behave with others by participating in social situations. The shaping of behavior to fit social norms. Socialization. Easy, not so much. Dogs usually get practice at socializing as puppies, interacting with their mothers and siblings. After that, socialization can come in many forms, including meeting other dogs, people, animals, being trained, and just basically being introduced to the world in interactive ways. Now, Simon’s socialization was easier to help because we adopted him as a puppy. Unfortunately, before we adopted Rosee she basically spent the first nine months of her life in a kennel and the few times she was around other dogs she ended up getting bit. It wasn’t until my family brought Rosee home that we saw exactly what the lack of socialization early on in life meant for a dog. Rosee hated dogs walking past the front door and window. She couldn’t stand anyone making any sort of eye contact with her. She would bark incessantly if she heard the neighbors’ voices when she was out in the backyard. Any time she saw a dog while out on a walk she would just go nuts by barking, whining, and jumping up. It wasn’t until consulting a trainer that my family realized she wasn’t doing these behaviors because she’s aggressive. She’s doing it because she’s scared, anxious, and nervous. Talk about mind blown. Even more out of this world was recognizing these nervous and anxious behaviors in Sunny. 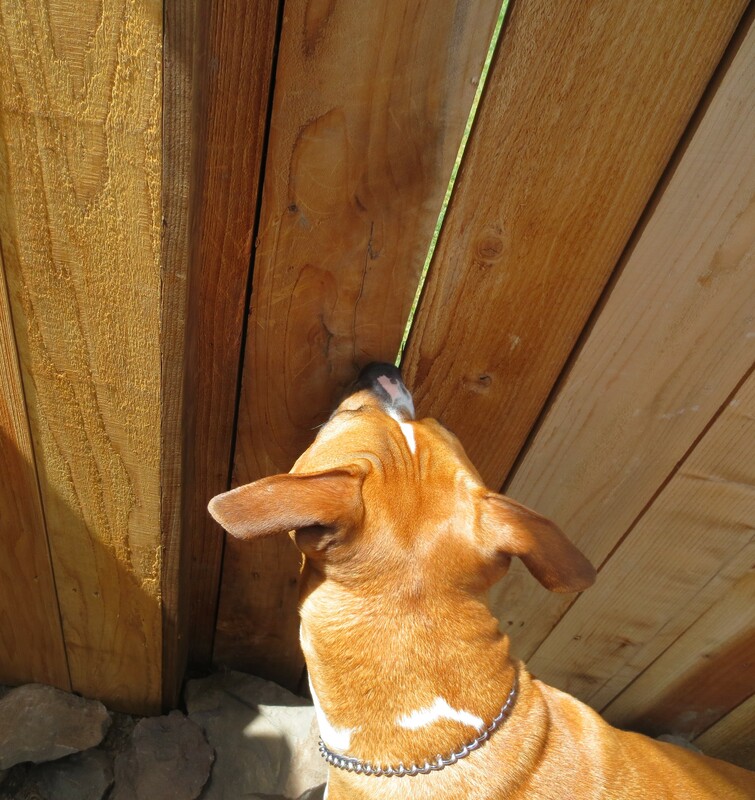 So, how did recognizing Rosee and Sunny’s actual problems come to be useful to diffusing the numerous fence fights? Well, by knowing the reasons behind Rosee’s actions Theresa and I were able to tailor training so that Rosee began associating good thoughts with the fence. For the past year and a half Rosee has been subjected to an obscene amount of treats for any good behavior she displayed while at the fence. When she didn’t bark just because she heard the neighbors’ voices she got a treat. When Sunny was in the backyard, but Rosee didn’t notice she got a treat. When Rosee wandered to the fence, but then turned away she got a treat. Basically, anytime Rosee did not concern herself with what the neighbors (the human and the canine variety) were doing she got treats. Lo and behold, it actually worked! The tussles at the fence have gone down dramatically, and not just in number, but also in intensity. 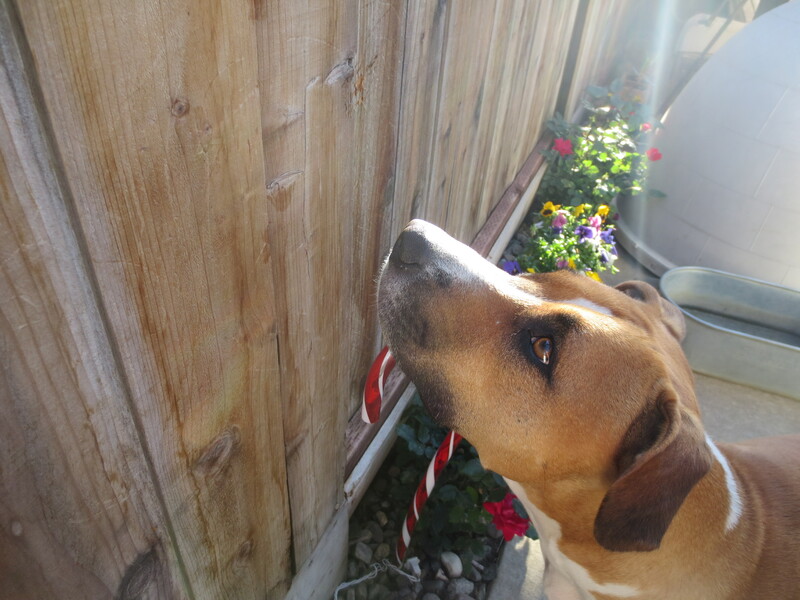 Now, Sunny and Rosee spend more time staring at each other rather than jumping at the fence. Instead of seconds lasting between the staring and the war cry, there are minutes stretching between the two. When I do hear Rosee at the fence with Sunny I can just walk outside and call her away, and she responds! The fact is Rosee has learned, and still is learning, that she doesn’t need to guard the backyard fence, that the neighbors’ dogs don’t need to be barked at (same goes with their humans), and that she can actually be friends with Sunny. This everlasting experience of dealing with non-socialized dogs, both directly and indirectly, made me realize that barking dogs do not always equal aggressive. Jumping dogs do not always equal aggressive. Howling dogs do not always equal aggressive. Yes, if teeth are being bared, jaws snapped, legs running up and attacking, those are pretty clear signs of aggression. 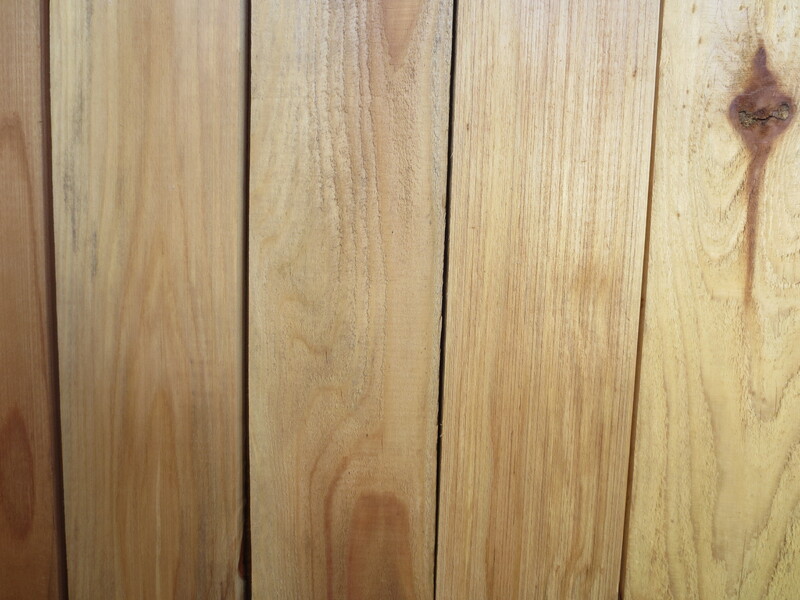 However, barking at the fence, jumping up and down, and war cries may have deeper meanings. Both Rosee and Sunny were simply dogs that did not get enough socialization as youngsters, and it had big implications for their behavior towards each other. And this isn’t just a call for ensuring people socialize their dogs, but also a spotlight on why it’s important to listen to dogs when they talk. Sometimes they are just saying hello, other times to stay away, and once in a while they are letting other people and animals know that they just don’t know how to interact with them. In Sunny and Rosee’s case they had to learn to be okay around each other, which also meant learning to be okay with others as well. It may have been a long, frustrating year and a half, but I have to say I am definitely looking forward to summer this year. Want to know why? 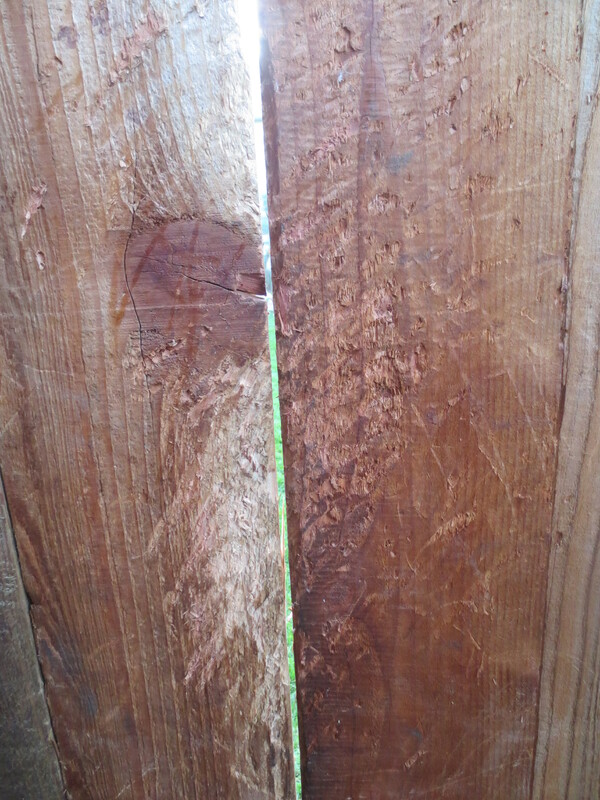 Replaced fence boards. Still without a scratch. I came home this past Friday afternoon only to have my mother tell me that earlier when she was out in the backyard with Simon and Rosee, the two found each other at the fence, stared, sniffed, and moved on. Rosee walked away to go lay in the sun on the grass and Sunny did the same in her own backyard as well. Now, that is a delightful best friend moment. I hate stereotypes, about anything really. I might find myself turning to them ironically or because “I’m Mexican I can say that,” but for the most part I find stereotypes to be hurtful and mostly generic representations of people based on what others believe them to be rather than what they actually are. This applies to dogs as well, if I hadn’t of already made that clear with Part One and Part Two of this series. However, I have a confession to make. Hanging in my backyard, up on the fence, is a sign that makes a very stereotypical statement about Pit Bulls. 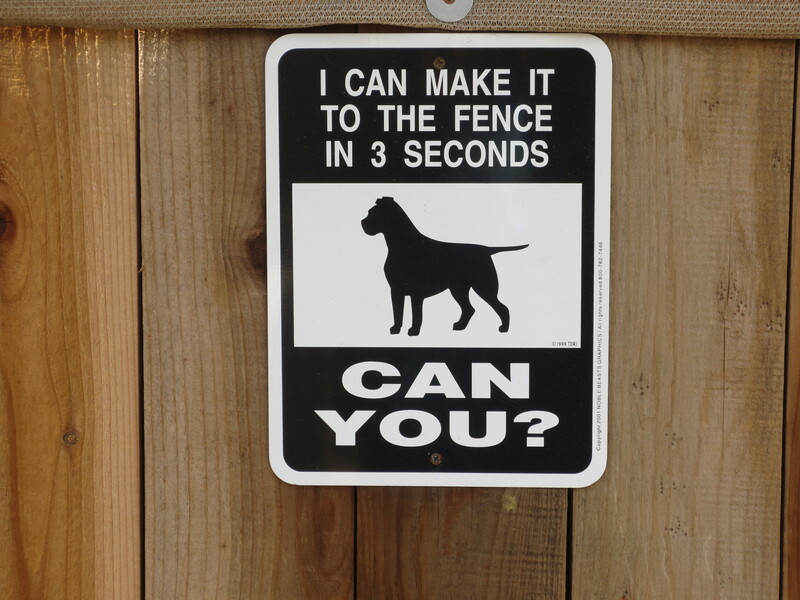 My sign reads “I can make it to the fence in 3 seconds. 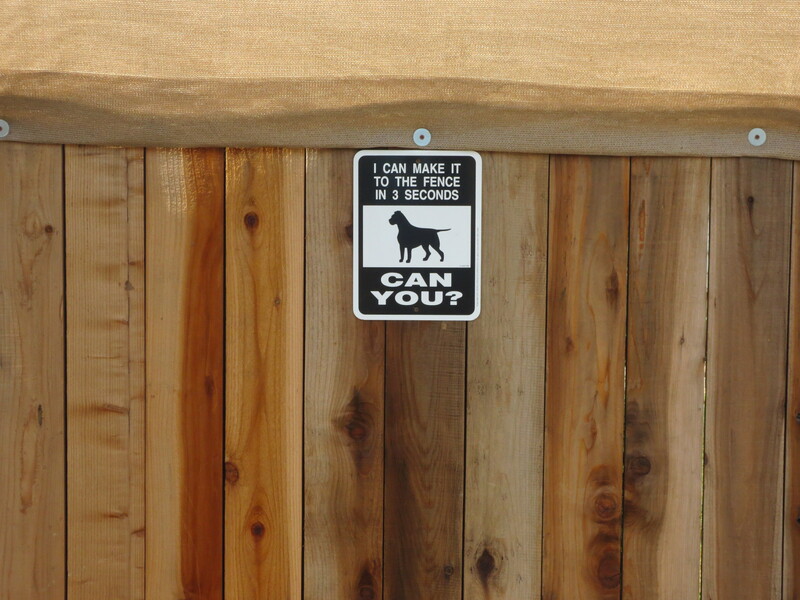 Can you?” and below the white lettering is a picture of a Pit Bull with its short stature and bulky chest. This sign hangs on the back fence, the same section of fence that separates Rosee from her best enemy/friend (besides Simon of course). So, why this sign? Why something that seems to point out the ferocity and aggressiveness of my dogs? It’s a simple answer really. What the sign says is true. Rosee, and Simon when he’s not distracted by pesky flies, can run out the back door and make it to the fence in seconds. The caveat? She only does this when she hears suspicious noises that she’s never heard before, thereby leaving her territorial nature in charge of all actions, or the neighbor’s dog is at the fence looking for her as well. The fact is this sign is not stereotypical to me. It does not say “Watch out! 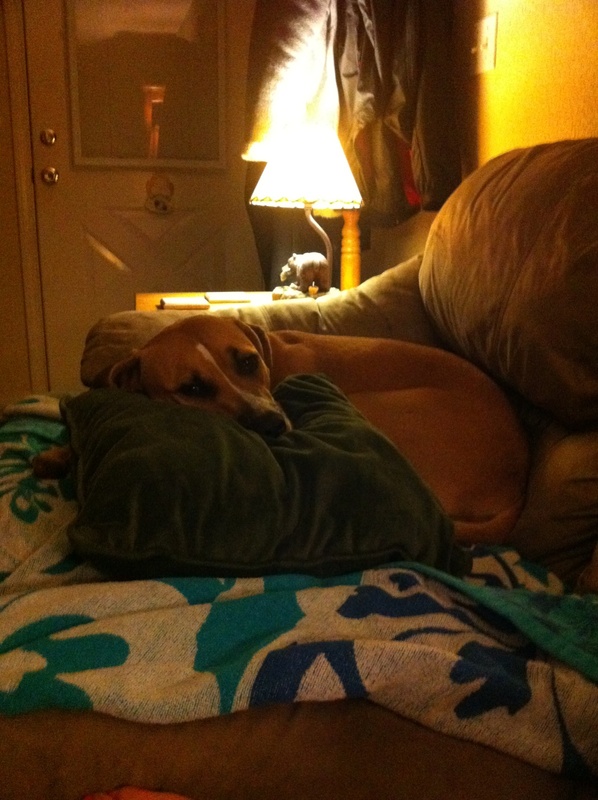 Vicious dog that can get to fence in 3 seconds.” It does not even have the words Pit Bull anywhere on the sign. For me it is a simple representation of my dogs and their great running abilities. The best part? This sign was not made just for Pit Bulls, but for all dog breeds. Tucked away into a small, cozy store front on Pier 39 in San Francisco, California lives the awesome pe t-themed shop named Le Beastro. With a clever name and not your everyday breed specific items for sale this particular shop is a dog lover’s dream. Le Beastro does not carry common brands of dog food or have a large assortment of dog toys. It has frames, cookie jars, t-shirts, socks, little plaques, metal signs, coffee mugs, and a plethora of specialized dog treats. This shop, though, might be best known for its multitude of breed specific collectible items, and when I say multitude I mean it! Le Beastro has items for pretty much any dog breed you could think of and possibly own, even the lovely breed Pit Bull. And when I say breed specific items I don’t mean muzzles made only for Pit Bulls or anything like that. The store stocks coffee mugs, signs and socks (and so much more) all with the image of different dog breeds. 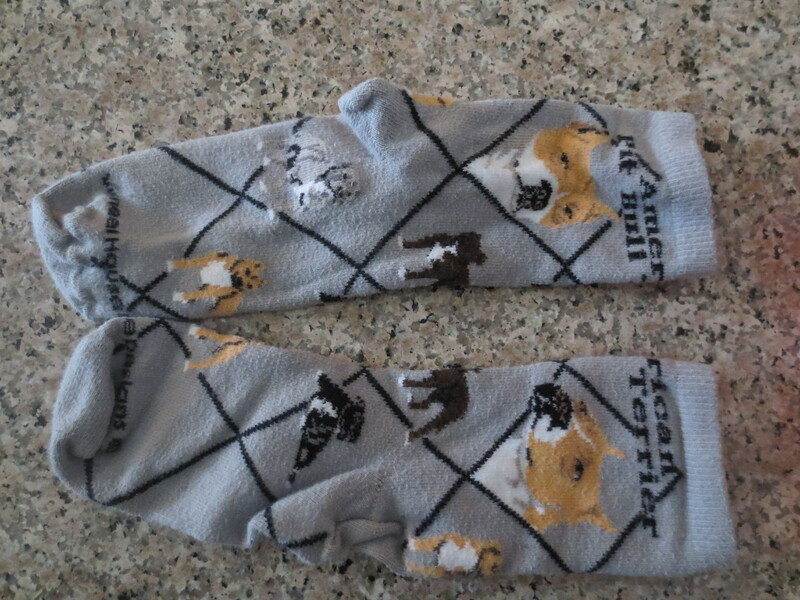 I myself became enamored with an endearing pair of grey socks covered in Pit Bulls. It was at this store, during a day trip to the city to eat great seafood and window shop, that I stumbled upon a whole section of boxes filled with metal signs which were further categorized by the many dog breeds the store carries. From the Beagle to the Yorkie, Le Beastro’s got it all. Most signs are denoted by the picture of the dog breed front and center, however there are also some that have the actual breed name written on the signs. There are your more usual signs like yellow diamond-shaped signs with the words “Dog Xing” across the front. Then there are the more tongue-in-cheek signs such as the one that now graces my backyard fence. I did not buy this particular sign because I own a Pit Bull. I bought this sign because it describes my dog, who just happens to be a Pit Bull, in a humorous way. Anytime I look into my backyard and see this sign I smile. It reminds me that my dog, though sweet and preferring to sleep most of the day away (if only Simon’s playful nature didn’t interrupt that preference most of the time) can still be a little rascal that likes to bark at any noise she deems interesting enough. We’re working on it though, I promise! As for Simon, bless his little soul, he can get to the fence just as fast as Rosee if only to turn around and bark in her face instead of at the actual fence. He too is working on his tattle tale ways. Call it a re-appropriation or reclaiming of an otherwise hurtful stereotype that all Pit Bulls are aggressive and mean, I feel that by owning this sign and proudly hanging it up I am admitting no guilt, supporting no Pit Bull nay-sayers, rather I am appreciating who and what my dogs are. I am recognizing that my dogs are not perfect. They jump on kitchen counters, crowd doors, cruise for food, run through the cat door to the garage, and Simon might as well never learn the command “Leave it.” But they are not imperfect because they are Pit Bulls (or at least honorary ones in Simon’s case because I just don’t know what makes him, well him). 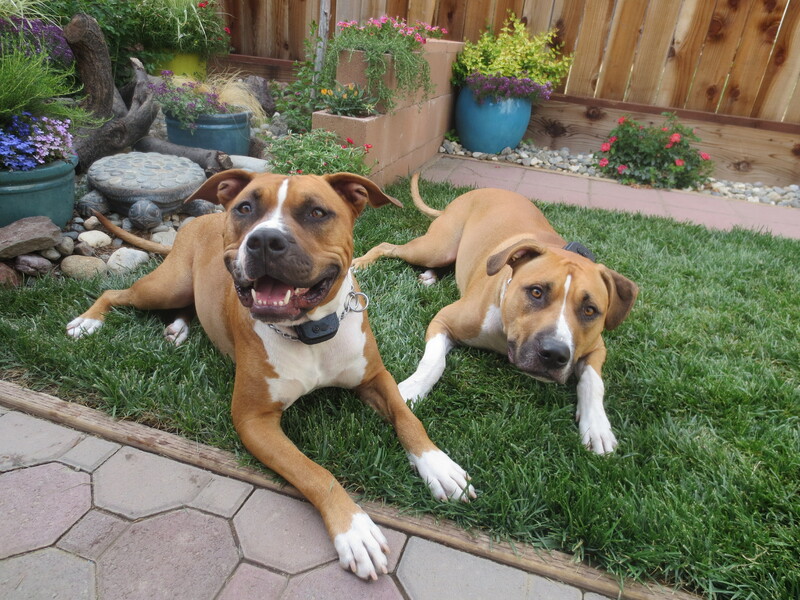 Rosee and Simon are imperfect simply because they are dogs, young ones still learning and growing. And I would never want them to be perfect anyway because where’s the fun in that? I adore Rosee’s cuddly yet alert personality and Simon’s crazy goofy nature. I know that my dogs are happy and comfortable in their home, that they get their required amount of energy-draining exercise a day, and never go without good treats. Most of all, I am proud of their breeds, known and unknown. I am proud that they know how to sit, lie down, roll over, shake, high-five, high-ten, crawl, and even bow. So, I embrace my sign and others like it, finding the good humor in its truth and not in its stereotypical-ness (because that’s totally a word). She’s quite the nosy neighbor. It was a beautiful California morning. The sun was shining, bees buzzing, birds singing in the trees. A perfect morning for a walk. Rosee’s leg was acting up so, unfortunately, she was forced to stay inside, but Simon was all smiles, ready to take on the world. Theresa and I cut up some Pup-Peroni, grabbed the house key, tethered Rosee, strapped Simon into his Illusion Collar, and went out the door (quite a to do list). We started walking towards the end of our street, Simon deciding to be good from the outset, and the three of us set a steady pace as we rounded the street corner. Upon arriving at the next street to walk down we were graciously greeted by two neighborhood dogs we hear all the time. Since these two dogs were particularly excited to see us today, and I could see Simon getting a little too excited by all the commotion, we quickly crossed the street to put some space between our groups and give Simon room to calm down. Apparently, this was the wrong decision. As soon as we crossed the street we were bombarded with the high-pitched snarling and barking of two small(ish) white dogs that had come tearing out of their house and right up to the white picket fence that blocked in their front lawn. Now, these dogs were mean. These dogs were growling and snapping, showing teeth and nails. These dogs were not filled with excess energy and looking for a way to burn it off. These dogs were not scared or anxious or nervous. These dogs were territorial and vicious. Normally, such a mean dog would be no concern. Theresa and I would simply cross the street, put some space in between ourselves and such terror, especially if we had Rosee. Except, in this instance we had just crossed the street to this side, and we could not go back. Essentially, we were stuck between a rock and a hard place, between loud dogs and loud dogs. Unfortunately, all I could do was walk out into the street, stepping around that parked cars, and put some space between my dog and the two little terrors. I thought I had found the solution, that everything would be fine and we could all go on about our business. I was so very wrong. Next thing I knew one of the little white dogs had climbed his way over his fence (which was no easy feat as it stood about five feet tall and the dog was probably ten pounds soaking wet), landed on the sidewalk and charged Simon. We were forced to walk into the middle of the street (luckily with no cars coming from either direction) and move quickly. This little dog must have thought he had completed his job though, because after running a few feet out into the street he then turned back around and continued to bark at us from the sidewalk in front of his fence. Needless to say, the three of us swiftly turned the corner and continued our way on our walk, never looking back. You want to know the worst part of this entire situation? The owner was right there. The owner of these dogs watched the whole incident play out. She watched her dogs bark and snarl at us. She watched her dog jump over the fence. She watched her dog chase us into the street. 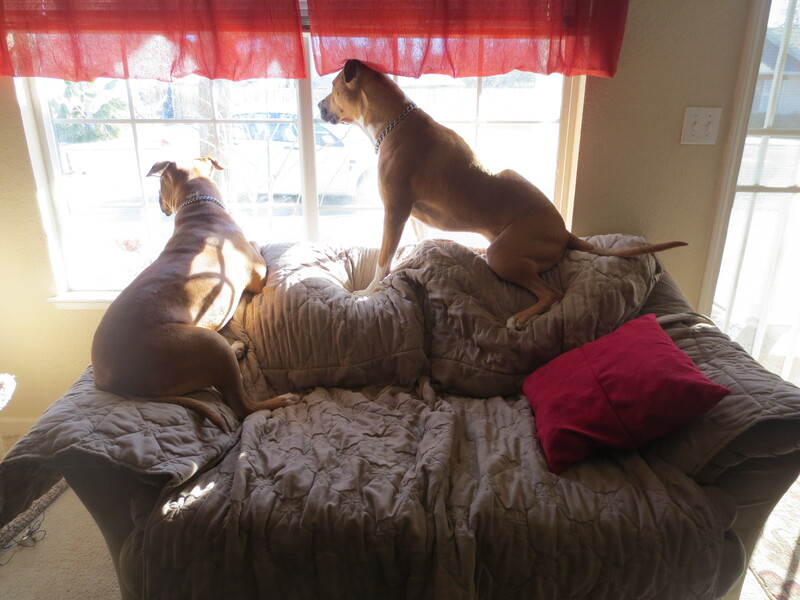 She watched everything while standing on her doorstep and just calling the dogs back. That’s it. She really thought that simply calling the dogs’ names would be enough to get through their territorial-filled haze and stall their rampage. It wasn’t (obviously). Now, why did I tell you this story? Why share a seemingly insignificant two minutes of my life with you? Nothing happened. No one got hurt. The dog went back home and we continued on our walk. Simon forgot about everything the minute we turned the corner. Simon didn’t even see these dogs as a threat. This silly boy just started jumping like it was all just so much fun! But I was upset. All I could think about was what if that dog had gotten closer? What if there were cars coming and we couldn’t run into the street? What if the dog actually bit Simon? What if the dog bit me or my sister? What if? Simon’s never been face to face with an aggressive dog before. He’s never had to deal with a situation where he was in danger and needed to protect himself. He’s never been bitten before. I worried about how he would react. Would he cry? Would he fall? Would he bite back? What would I do? Simon’s obviously the larger dog. Would an animal control officer even believe me if I called and reported that he had been the one attacked and was not the one doing the attacking? I’ve heard too many stories of people calling about other dogs, yet their dogs ending up in trouble simply because of what they look like (i.e. Pit Bull-ish). Would the other dog’s owner get mad at me? Would she call on my dog? Would she blame me and my dog for “starting something”? Call it over-reacting, but all of these questions run through my mind every time another dog comes after my dogs. And unfortunately, this is not an isolated incident. In the three years that I have had dogs we have been run up on/charged/chased/whatever-you-want-to-call-it quite a few times. The dogs have ranged from large German Shepherds and black Labs to Chihuahuas (have I mentioned that there a lot of loose ones in my neighborhood?) to Basset Hounds. All of our would-be attackers have not been mean or aggressive, some just curious puppies that haven’t learned any better, but for whatever reason they have come up on us they all had one thing in common. In every situation the owners have been right there, watching the whole time and doing absolutely nothing. Whether they truly believed that their dogs would listen to them and come back, or they thought their dogs would cause no harm, in my opinion these owners were irresponsible. These owners were thoughtless. These owners were inconsiderate. These owners were reckless in trusting someone else’s dog to be just as nice as they thought theirs to be. While Simon has no problems with dogs, loving everybody and everything, Rosee does not. Rosee might look nice and sweet as she walks down the street, but she has her issues and unless I put a big noticeable sign on her back that says “Scared and nervous around other dogs. Keep away” these people don’t know that. But why should I have to label my dog? I am the one being a responsible dog owner, keeping her controlled and comfortable on her walk. I bring treats so as to train her to ignore distractions and to calm her down if she experiences an uncomfortable situation. I give her space so that she is not a danger to anyone or thing, and nothing is a danger to her. I read her body language and respond accordingly. So, why should I have to shame her with a sign just because other people can’t control their animals? Why should I have to pull Simon into the middle of a street? 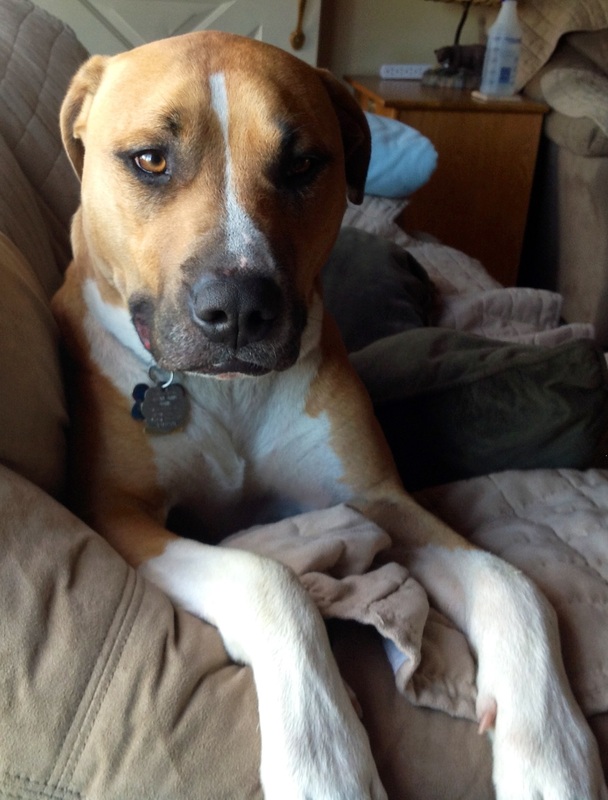 Why should my dogs be put in danger so that someone else’s can exhibit bad behavior? Because ignoring one’s owner and rushing another dog is bad behavior. Obviously, I haven’t figured out any answers (otherwise I would be sharing with you the secrets to the universe). I can only live in this world and deal with things as they happen. And like some people I tend to dwell a little more on negative experiences than positive ones. I remember bad times more clearly than good times. This walk with Simon had two bad minutes out of fifty good ones. We continued on our walk and Simon was a perfect angel. It was a good day. Except, in my mind I remember those two minutes. I remember how I felt and what I did. I remember the dog getting over the fence. What I need to remember is the way Simon walked right by my side during the entire walk. I need to remember how Simon didn’t pull on his leash and how enjoyable our walk was. So, I suppose the moral of my story is this: Be it you have a small, medium, or large dog and you are a responsible owner it might be really annoying (and slightly dangerous) when you have to deal with other people’s dogs’ bad behaviors, but deal with it (because you’re being forced to) and move on. Focus on the positive. Be proud that you could control your dog. Be proud that you know your dog well enough to take care of a negative situation. Be proud even if your dog freaks out like Rosee does (though less than she used to, it’s all progress!) because you didn’t. You were a champ, a rock star, a constellation shining brightly in a dark sky! Your dog doesn’t have to be perfect, mine certainly aren’t, and you don’t have to be a perfect owner, I’m definitely not, but I care and you care. Apparently, that makes all the difference. Every time my family drives down to visit family that lives in the Sacramento, CA area our car passes a fold-out sign left on a street corner to advertise for some local gym. What initially drew me to this sign, as oppose to all the others you can find around an urban town, is the design that encompasses the entire front side. In place of a spokesperson for the gym is the dark and angry face of a Pit Bull. Seriously, his eyes are black and downcast, with an ugly frown on his face, and his entire face is placed in shadow. Now, I get the meaning. Gyms are indicative of strength, aggression, and power. A Pit Bull is often portrayed in popular media with the same connotations, represented as a thing that is inherently aggressive, strong, and powerful, and is such for all the wrong reasons. Buy why couldn’t this gym use a German Shepherd to portray strength and power? Many dogs of this breed are trained to attack as police dogs, trained to be dominant and commanding. Or how about a gorilla? A mythological-looking dragon (because they’re pretty popular right now)? A Megalodon shark (because they totally exist, just like mermaids do!)? Nope. They had to use a Pit Bull, because this breed is so intrinsically entrenched in society that their mere mug stands for aggression and power, though always with a negative tinge. The fact is in our society the face of a Pit Bull is undeniably linked to all things bad, like dog attacks, biting, dog fighting rings, and just plain terribleness. There has been pushback, obviously, as people who love and understand the breed work to correct society’s mistake, but we haven’t quite overcome the negativity yet in order to use the term in such an unbiased and non-indicative way, so that this gym’s representation only furthers the negative stereotypes that the Pit Bull carries, whether it meant to or not. Recently reading this open letter a mother had written in answer to yet another great debate online, I was captivated by a particular line in which this woman labeled herself as a “Pit Bull mother.” Apparently, this woman’s children refer to her as such when she becomes increasingly overprotective and aggressive. While I find nothing wrong with defending one’s family and way of life, this use of Pit Bull as some sort of describing word left me with feelings of negativity and regret. Why couldn’t she write that she is a Lioness? A Tigress? A Bear mother? A Velociraptor? (Jurassic Park anyone?) No, she had to write Pit Bull, because of course these are the only animals that are naturally aggressive and mean. 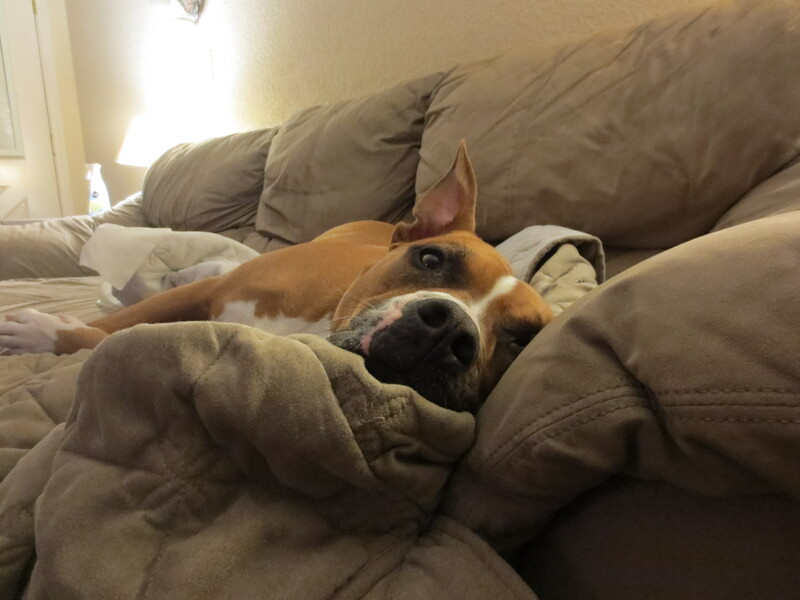 Certainly, nobody uses Pit Bull to describe a person being cuddly or cute do they? (And I am referring to someone who does not love and understand the breed, because of course those who do would.) No. 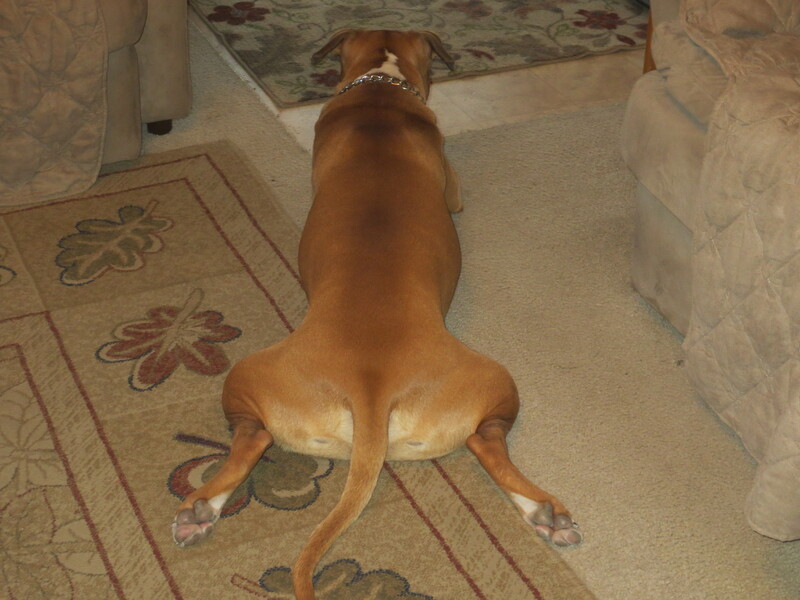 Pit Bull is clearly reserved for describing those meant to be naturally aggressive, strong, and powerful. The writer of this open letter used Pit Bull to get her point across that she will “attack” when necessary, and though she meant in defense of her family, her usage instead brings up stereotypical images of Pit Bulls attacking and fighting, because obviously that is what this woman believes Pit Bulls are only capable of. Her wording, unfortunately, relies on these hurtful negative stereotypes in order to let her audience know just how vehement she is in taking care of her family. So, while I understand her meaning, I still consider her usage to be a bit irresponsible. Now, I don’t mean to judge anyone too harshly. I don’t know the reasons behind deciding to use Pit Bull as anything other than to describe a dog’s breed. I don’t know if these gym owners or letter writers own a Pit Bull and are fantastic dog owners. I don’t know if they consider themselves Pit Bull advocates and truly believe that their representations as described are used in good faith. I don’t know. What I do know is what I see and what I feel when I look at signs or read letters that use the Pit Bull to make a statement. I know that reading someone call herself a “Pit Bull mother” is saddening to me because my little girl Rosee is not inherently aggressive. Rosee does not rise to the defense of others because it is in her nature to be mean and powerful. She becomes loud because she’s scared. She’s so anxious and nervous about the world around her that she decides to act mean (by barking loudly mostly) before anyone else (dog or human alike) can be mean to her. She’s dutifully working on accepting the world, on trusting those who inhabit it, but it is a process. She’s no angel, but she’s certainly working her way up to it. I know that Simon can look aggressive and intimidating (all 75 lbs. of him), and can sound larger than life (his bark is pretty deep), but he’s one of the happiest dogs you’ll ever meet. He has no mind space for negativity and meanness, only room for playing tactics and walking routes. His handsome mug on a gym’s sign would probably draw customers that were excited and playful, simply looking to have fun and I guess that would be bad for business. I know my two are not the only dogs in the world that defy the negative Pit Bull stereotypes. All I have to do to remind myself is walk around my neighborhood, read stories online, or watch television shows. I am reminded that my two pups are not the exception, rather they are the rule. They represent the larger group of Pit Bulls that exist in the world that are happy, healthy dogs. They represent every dog in general who is happy and healthy, and those that are still working their way there as well. So, I guess my point is until Pit Bull stands equally for strength and cuddliness let’s pledge to use the term responsibly, or at least in its natural form, i.e. to describe the Staffordshire Bull Terrier, the American Staffordshire Terrier, and the American Pit Bull Terrier. Let’s pledge that Pit Bull is no different from Golden Retriever, Labrador, or even Chihuahua. It is just a name given to three similar breeds of dogs. It is a nickname, a moniker, a category. When we hear or read stories about dog attacks or dog fights let’s focus less on the breed of a dog, whether it is a Pit Bull, and more on why such things even happened. Let’s not give into popular media’s negativity towards Pit Bulls or any other breed for that matter, because the media is just looking for a story to glom onto, nothing more. And while a certain breed might lean towards some characteristics or personality traits more than others, nothing is set in stone. I’ve met Golden Retrievers who want nothing to do with humans even though this breed is known for being people-pleasers. I’ve known German Shepherds that only want to lie around on the couch, instead of being active and dominant dogs. I’ve met Labs, who are always believed to be super friendly and gentle, that are mean and pushy instead. The fact is breed means less. I believe that with dogs it is very much a nurture over nature situation. Pit Bull is just a name, it is the way one is raised that makes all the difference. **Created from popular perceptions portrayed in the media and experienced by this author in real life. Out for our walk yesterday, my sister and I (and Simon and Rosee if it wasn’t already implied) encountered a man riding his bicycle the opposite way we were walking. As we passed by each other the bicycle rider called out to my group saying, “Those are some nice looking dogs.” Feeling appreciative, I smiled and nodded as my sister and I continued on our way. Now, I’m sure there are lots of people out in the world who get compliments about their dogs, their looks and behavior. And in any case it’s flattering, and makes owners feel good about their pets and their skills as owners. I know for me personally, when passersby comment on my dogs being pretty or beautiful, or even well-behaved, I feel a sense of pride and accomplishment that after my many years of hard work and dealing with dogs that hate bath-time (but love water) all of my blood, sweat and tears have started paying off. Training dogs, and therefore training one’s self as any good disciple of Cesar Milan believes, is not always easy or done quickly. Rather, training takes time and effort and a willingness to change, to adapt to your dog’s needs so that everyone involved, dog and human alike, can learn to coexist happily and safely. However, there is a deeper issue at play when it comes to being proud and accomplished of my dogs. 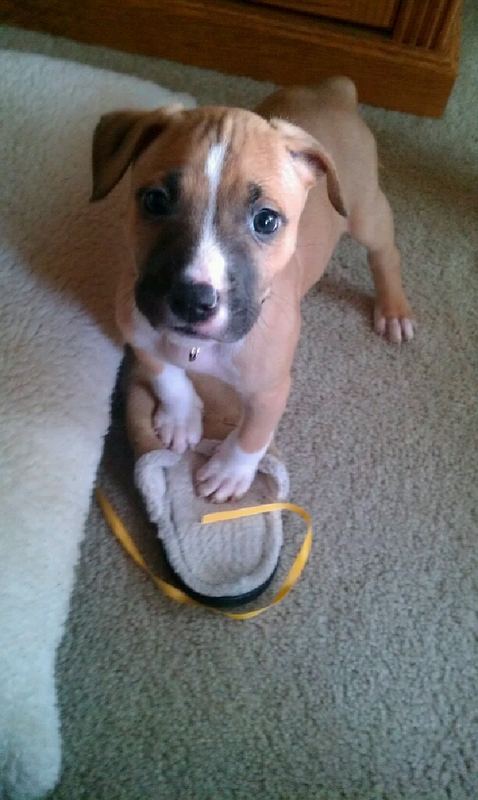 You see, Rosee is a Pit Bull. Her breed is pretty clearly seen in her face, her stature, her gait, and her personality. Her face is wide, her smile wider when she’s really happy, and girl’s got muscles, which she puts to good use rolling around in the grass or picking oranges from the tree. She’s a little taller than most Pit Bulls and I like to think she gets that from her Boxer half, as well as her over the top energy spurts. 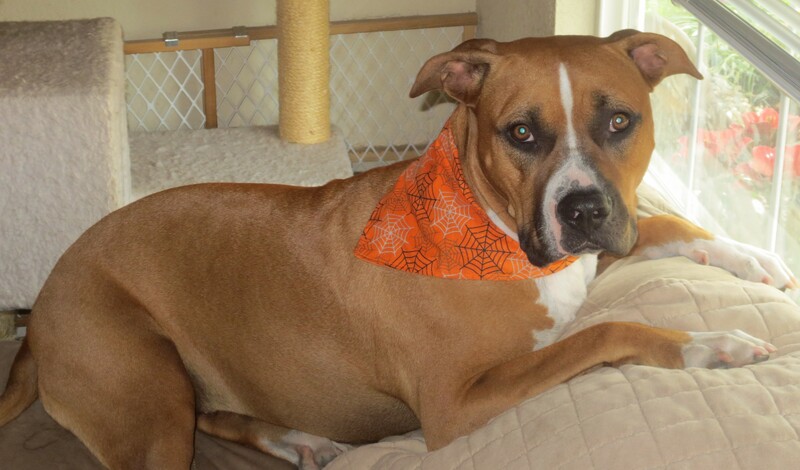 However, when people pass by her on the street or see her at parks most see a Pit Bull and, unfortunately, act according to their stereotypical perception, which means they are afraid of her. People will yell at their children to get away from us, they will pull their obnoxious-acting dog close to them as if Rosee simply looking their way is threatening enough, and they will talk in not so hushed tones, making comments about “that Pit Bull.” It’s quite true that for many people they will never actually experience the ugliness of racism until they own a Pit Bull. Now, the truth is I try really hard not to care what others think or say about my dogs. Both Simon and Rosee have their behavioral issues that my family and I have worked tirelessly to correct and deal with over the years, but even so neither dog is perfect and always learning. If during a walk or while out at a park I need to take the time to correct or calm down my dogs I’ll do it, regardless of other people’s reactions. However, it is still frustrating and hurtful when people look at my girl as if she’s a demon, despite the fact that the worse thing she’s doing in barking. (And I really hate the double standard between her and little dogs who are viciously trying to get to us, while my girl barks and then moves on.) I hate how people judge Rosee because of what she looks like, and not based on her behavior. Instead of seeing a fearful and anxious dog who is working on getting used to being around other dogs and people, all they see is an aggressive Pit Bull acting like its breed dictates it should. 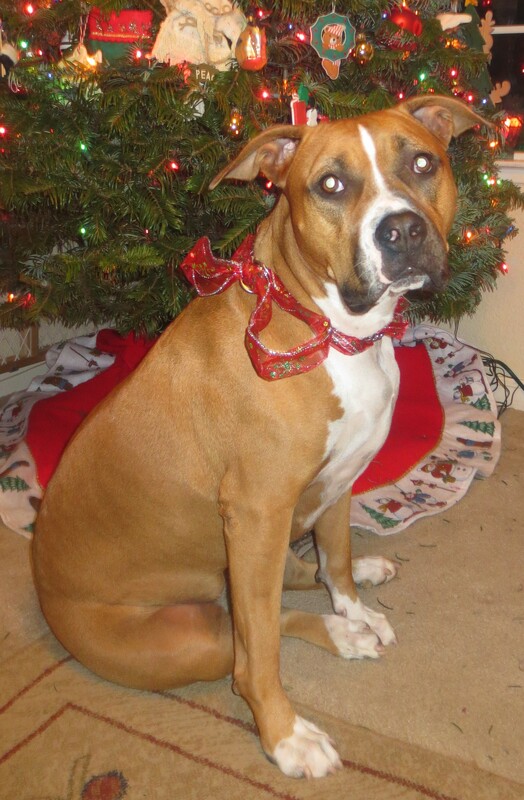 Rosee at Christmas. She’s just so vicious with a bow around her neck. Sometimes I wish I could put a sign on Rosee’s back that lets others know all of her issues. She grew up in shelter for the majority of her life. My family and I adopted her when she was about nine months old. Before being adopted she lived with a foster family for three weeks under the care of a rescue organization, who had previously rescued her from a shelter where she had lived since she was about two months old. Due to this Rosee did not get proper socialization with other dogs and people, meaning she barks at everything and is acutely afraid of men. It’s nobody’s fault that she ended up this way, just the product of over-breeding in a world not big enough to accommodate. So, despite being a sweet and lovable little girl who just wants to cuddle on the couch, she is territorial of our house and yard, and she is fearful when faced with seeing other dogs. However, knowing her issues, going to training, reading every book we could get our hands on, and being committed to making life as happy and comfortable for her as we could, my sister and I have brought Rosee a long way from when we first got her. She can go on walks and not care about other dogs. She’s okay with people making sustained eye contact with her. Most importantly, she’s confident that her humans will keep her safe. Unfortunately, people we pass on our walks don’t know all of this history. They only see a Pit Bull. I find it so funny that when people we pass us their actions indicate fear of Rosee, which in turn is what alerts her that there is something to be afraid of and so makes her afraid and act out. These people don’t realize that their human actions are what are signaling to my dog to be afraid in the first place! We are nothing if not caught in a web of continuity. As much as I don’t like it when outsiders judge my dogs, I don’t want to judge outsiders too harshly either. I don’t know what’s happened in their lives to make them feel the need to make nasty comments about dogs they know nothing about. At the end of the day the situation just isn’t fair and it’s hard work trying to turn my dogs into model citizens only to have people hate them anyway. But in the immortal words of my high school Spanish teacher, “Life is work and then you die.” He was so optimistic. Simon’s too focused on the treat being used to make him pose. I can only try to live up to his wisdom and rise above those who use stereotypes to dictate how they treat other humans and animals. Nobody is perfect and I can only hope that teaching my dogs to act like good dogs, not just good Pit Bulls, will help change the world’s stereotypical perceptions of them. The 14th of February is a special day in our household, and not because it’s Valentine’s Day. In our house February 14th is Simon’s birthday and this year he is turning 3. Normally you probably wouldn’t think that turning 3 is a very important milestone for a dog. Except from everything I’ve read and dog-people I’ve talked to 3 years old, for their breeds at least, is the age when Simon is supposed to have achieved adulthood. He’s not supposed to have any problems stemming from puppyhood and he should have outgrown all of the adolescent quirks he may have picked up along the way. However, the operative phrase in that sentence was “supposed to” because while he is a good dog he does sometimes regress into bad behaviors such as stealing food off of the counter every once in a while. Still, even I have to admit that Simon has grown up a lot over the past year. He doesn’t go crazy in the mornings as we get ready to go for a walk, he seems to actually listen when he’s given a command, and he is much calmer than he has ever been. Of course, these changes are also due in large part to changes on behalf of us humans such as learning to be patient and calm, and most importantly being consistent with him. Nevertheless, Simon is growing up and I can’t stop from thinking back to when he was just a young pup. Simon got his start in life as part of a litter of puppies that someone left on the doorstep of one of our local fire stations. 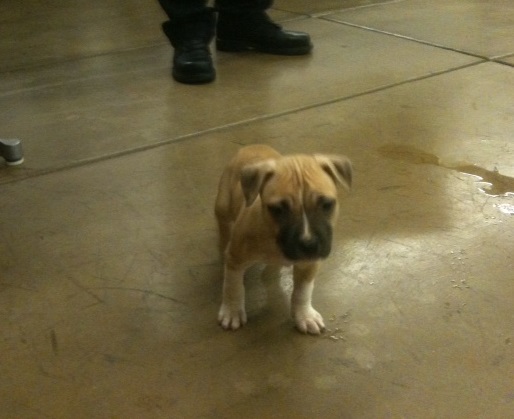 The firefighters sent out an email to all city employees, which my mother happens to be, asking if anyone was interested in adopting a puppy. After we saw the attached pictures as seen below it was pretty much a done deal. The puppies were only going to be held at the station for a day and if they weren’t adopted the firefighters were going to take them to the local animal shelter. Fortunately, all the puppies were adopted that day, and Simon was welcomed into our lives. As a puppy Simon was energetic, and even now he is still mostly a…mystery, if you will. 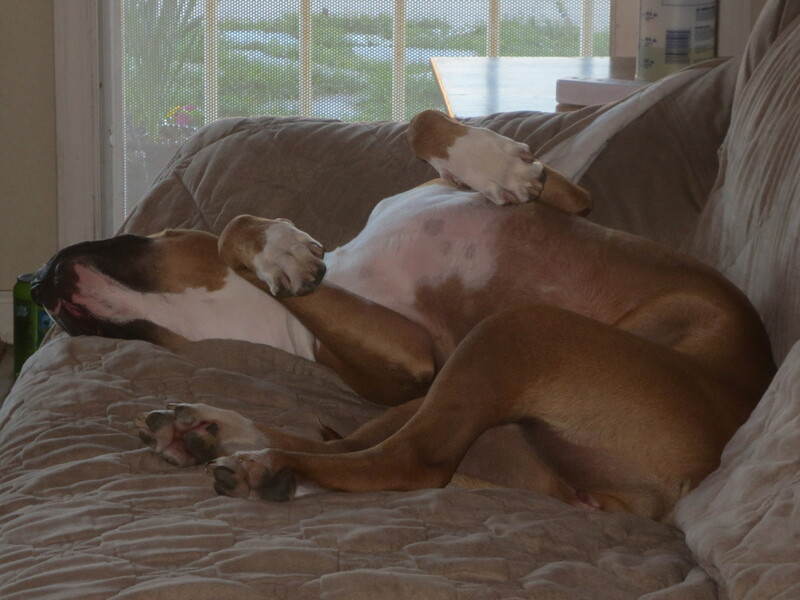 It has never been clear exactly what kind of dog he is and he seems to defy any category we try to put him in. He loves being the center of attention, but hardly pays attention to things himself. Sleep has never been one of his priorities, but he is a natural born cuddler with any blanket. He can learn a hundred new tricks a day, but only chooses to perform said tricks when he wants. He loves water and to swim, but barely tolerates baths. Perhaps it is these contradictions that we love most about him. We had hoped once he was neutered he would calm down a bit, but it didn’t seem to change him at all. In fact, the veterinarian told us that almost as soon as he was taken out of surgery he was awake and wanted to play. All I can say though is that’s Simon for ya. Now as we approach his 3rd birthday I appreciate all that I have learned from him. 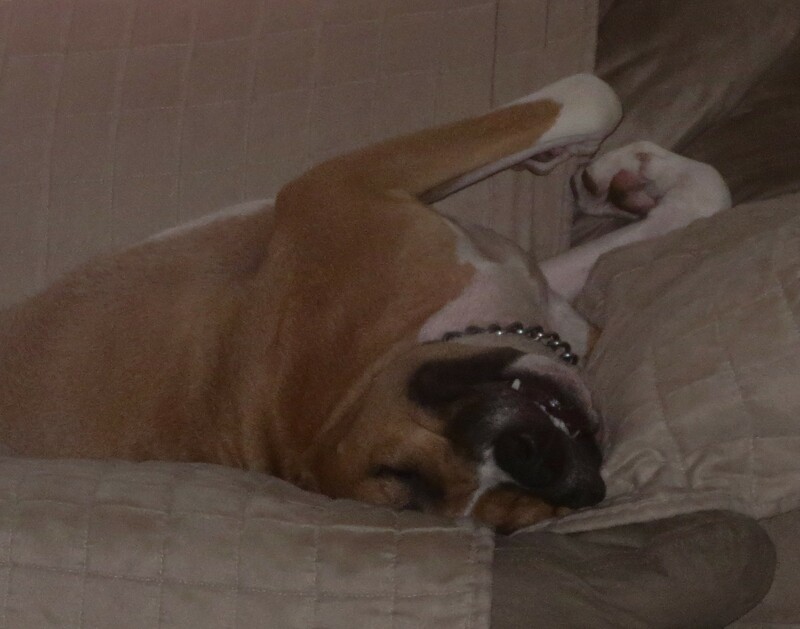 He’s definitely a special dog. Below I have compiled a few tips on how to not get your dog to stop barking, either at the front window or the front door. These tips are based on very scientific research and thoroughly tested hypotheses. I hope you find them of some use, so that you learn what may not work for you and your canine doorbells. Tip #1: Do not think that you can out-yell your dog. Attempting to yell over your dog, as if your voice can somehow top theirs, is a bad idea–one that is sure to only lead to a pained throat and a lot of frustration, none of which will have affected your dog’s countenance at all. Tip #2: Do not use a worthless treat (i.e. carrots for my two) to try and distract your dog from whatever has caught their attention outside. In the immortal words of many trainers, make sure to use a “high-value” treat (i.e. hot dog, cheese for my two) to lure your dog away from said window or door. Tip #3: Do not attempt to physically remove your dog from the front window or front door. It is pretty impossible, in my case, to move my two behemoths, both who weigh in at over 70 lbs, away from the front door or window when they see something worthy of their barking skills. Attempting such a physical act is a surefire way to only increase your own frustration, and I’m sure it is already up because you did not listen to Tip #1. Tip #4: Do not use a spray bottle if your dog loves water. Since your dog loves water, much like my own Simon does, spraying them with the liquid substance will do absolutely nothing. Even adding vinegar or lemon juice, things dogs are not supposed to like but are not harmful to them, may produce no promising results either if you also have a dog that loves everything. Tip #5: Do not listen to anyone else when it comes to dealing with your dog. You know your dog better than anyone else, seeing as you spend the most time with him or her, so only you can decide what is the best way to try to stop your dog’s barking (or any other problem behavior). Find out what your dog likes and doesn’t like, what he or she responds to, and go from there. And don’t be upset if nothing works to completely rid your dog of its barking tendencies. Barking is what a dog does, to try and stop it completely would be like trying to take away a person’s voice, cruel and strange. Even after working with Rosee for over a year she still barks at the kids who walk past our house every afternoon when school lets out, and you know what? Those kids have learned to ignore her. I’m so proud of them. So here’s to all the barking dogs that exist in the world today, because believe me you’ll miss it when it’s gone.